Crime Scene Clean provides blood cleanup services for anyone in need of them. Regardless of the extent of the injury or what happened, the area needs to be cleaned up and disinfected in timely manner so that it doesn’t negatively affect anyone who comes into contact with the area. Our cleaning professionals are trained and certified in OSHA and EPA crime scene cleaning guidelines, and our unmarked trucks ensure that we will be discreet and not bring any attention to you when we arrive at the location. We are also insured and bonded and we work with many insurance companies so that there is no out-of-pocket expense to you in this possible time of distress. Contact us today and we will come out to your location and get started on cleaning and disinfecting the area. We will go out to any location to clean up blood and other bodily fluids that have been spilled. Whether commercial or residential, industrial or any other type of location, we will come to you to disinfect and clean the area of any blood, bodily fluids, filth, and other bio-hazardous materials. Having professionals handle blood cleanup is very important, as we have the techniques and equipment to ensure that we are well-protected from any bacteria, disease and other germs that we may come in contact with when cleaning blood and other bodily fluids. Give us a call today and avoid putting yourself at risk. We will clean the area so that it is disinfected and can be used once more. Blood can make many people queasy. Our blood cleanup professionals have extensive training and experience so that you don’t have to worry about any weak-kneed cleanup technicians coming to your location. When we come out to the area, we will put our expertise and training to good use. 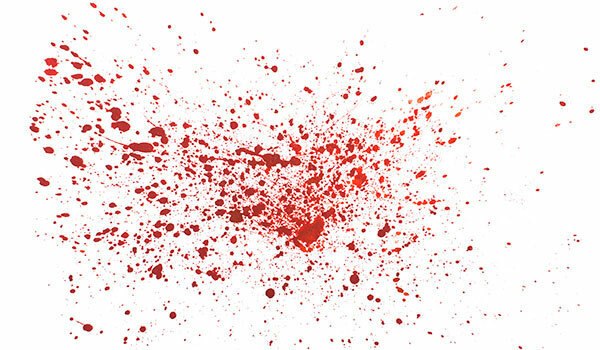 Regardless of if we are there due to a crime scene situation or an accident of some sort, our blood cleanup protocol will ensure that everyone is safe from any harmful contaminants in the area. We will block off the area, regardless if it is one room or a large area such as the entire property. We will then remove any material that cannot be remedied, such as furniture with fabric and more. And then we will start cleaning and disinfecting each and every surface that has been contaminated with blood or another bodily fluid or bio-hazard. We finish our cleaning services with testing the area to ensure that it is safe for people to enter again. There are many risks involved with cleanup, and only those with the proper techniques and equipment should handle the job. Common blood borne diseases and STDs include Hepatitis, and HIV and AIDS. Anyone who is not properly prepared when cleaning up matter such as blood can contract these and other, rarer diseases. And that’s a risk that no one should be subjected to. Contact us today to handle the job for you so that there’s no risk for you. Regardless if you have a private home, a rental house, apartment, business setting, or any other type of location, the professionals at Crime Scene Clean will come out to the location and help you clean and sanitize the area. We simply want to help the area return to a safe condition, so no matter where you are, we will help you out. We understand that you most likely are going through a tough time right now. Whatever has warranted the need for us to come is probably very tough to bear. We are passionate and respectful about this and we will do everything we can to help make your life easier. We will work with your insurance company and show up in an unmarked truck for discretion purposes. It’s how we try to help. And we provide our blood cleanup services to many southern states and cities, including Texas, New Mexico, Oklahoma, Louisiana, Kansas City, and more. Contact us today for any blood cleanup services you require.